The main section of Zion National Park is not terribly huge. The section of park along the North Fork of the Virgin River from the park entrance to The Narrows is only about 6 or 7 miles long. But that stretch of canyon houses within it’s hallowed walls some of the most dramatic and iconic scenery in North America. There are monuments and trails within this sliver of earth that many only dream of visiting. 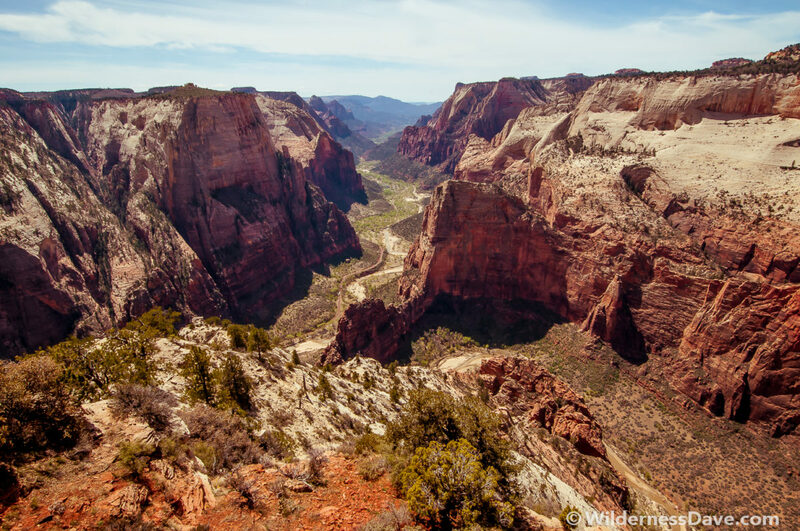 We’d see icons like The blood streaked Altar of Sacrifice in the Towers of the Virgin, the Sentinel watching over the Court of the Patriarchs, and the Great White Throne of God looking down upon the razor thin edge of Angel’s Landing. 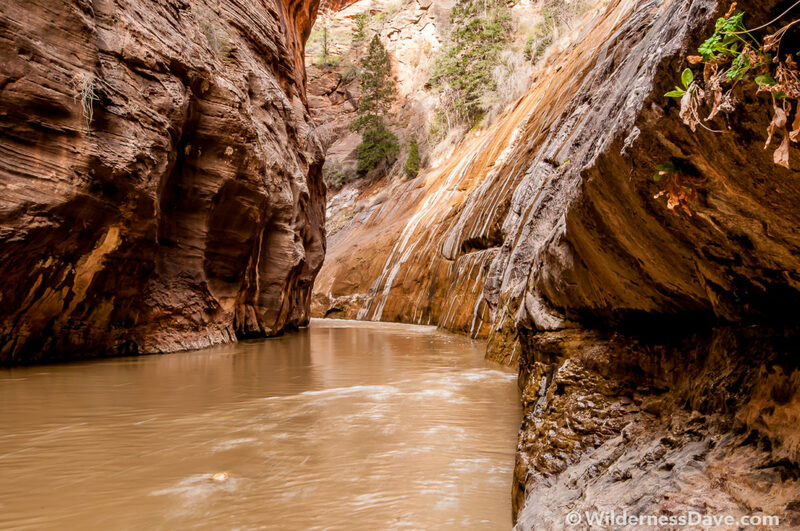 We’d walk among lesser icons like Echo Canyon and plunge our tired feet into the frigid waters of the Virgin River. Sharp gusts of canyon wind carried a chill through the darkness at camp, rustling the grasses and the cottonwoods. I fumbled with breakfast in the dark while we packed for the day. Dave, who is more accustomed to lightweight backpacking than I am, carried a tiny bag with almost nothing but water and a few small bags of snacks. I had my camera gear to contend with and shouldered a far heavier burden. The earliest park shuttle would arrive at 7am and by 6:45 we were the only ones stirring in camp, a good sign we’d have the trail to ourselves. The morning sky was just beginning to glow as we walked quietly among the deer that were loitering at the visitor’s center. There were only two others on the first shuttle of the morning from the visitor’s center. The other early risers were an elderly fellow who had plans to see sunrise from further in the canyon and fairly large man in a ponytail who wanted to “hike Angel’s Landing without his wife and kids slowing him down”. We picked up a few more ambitious hikers before reaching The Grotto, where we would find the trailhead to Angel’s Landing. We chose to conquer Angel’s Landing first for a few reasons: First, I wanted to shoot from Angel’s Landing in early light. From all accounts, this would be a technical, heart-pounding hike with serious exposure and there was no way we were going to try to hike it for the first time in the dark just to catch “sunrise” from the top. I was happy being able to shoot in the early morning light, hoping for something dramatic. Second, we wanted to beat the crowds of weekend warriors and all-out tourists shuffling up the trail. 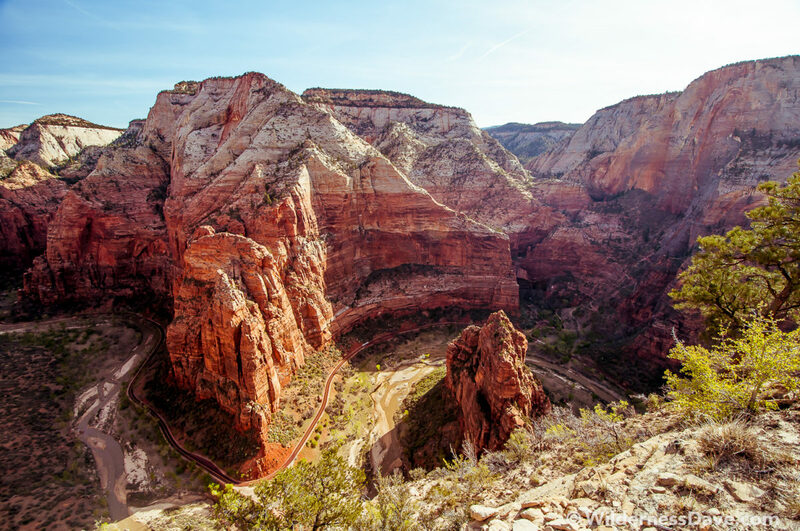 The park tells you to plan 4 to 5 hours for your round-trip to Angel’s Landing, but we were confident we could shave that down a little. Angel’s Landing was an absolutely amazing hike. Short, a little strenuous, and potentially nerve-wracking for anyone with a possible fear of heights. Since neither of us have ever experienced a fear of heights, the hike wasn’t as white-knuckle-scary as it was made out to be. There are a few sections where well-worn chains guide you along and give you something to cling to. I don’t think the chains are necessary though. We were alone hiking most of the trail, running into very few people hiking that early. We made short work of it clawing our way to the very end of any navigable path within 45 minutes of leaving the shuttle bus. We spent nearly an hour at the tip of Angel’s Landing just enjoying the view and taking pictures and never saw another tired, sweaty soul until we packed up and headed back. On the return hike it was easy to see how this hike could turn into a 4 hour ordeal when it gets crowded. We never did see Ponytail. Before too long we were back across the Virgin river and waiting for the next shuttle to take us up the canyon to Weeping Rock where we’d catch the trailhead to Observation Point. This was a busy trailhead, but we were ahead of schedule and doing well to stay ahead of the real crowds. 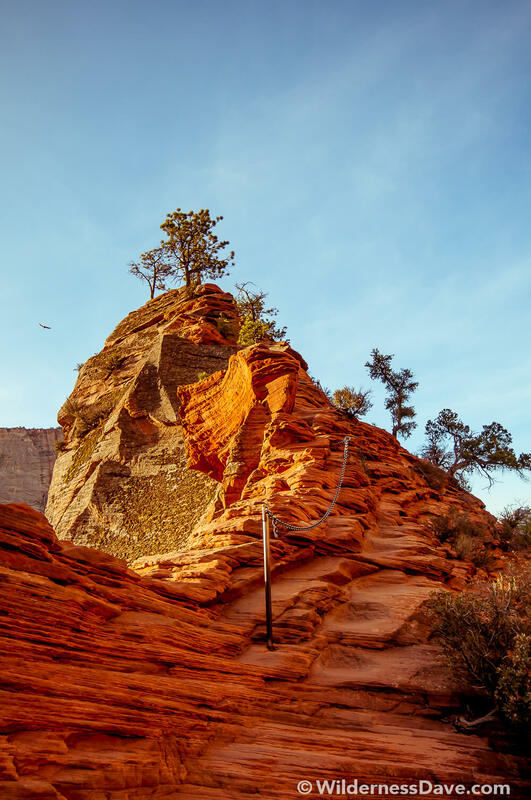 The beginning of this trail can be busy as it’s shared with those making the short hike to Weeping Rock, or venturing a little further to see Echo Canyon. A small fraction continue on up the long, winding, never-ending swithcbacks leading to Observation Point. 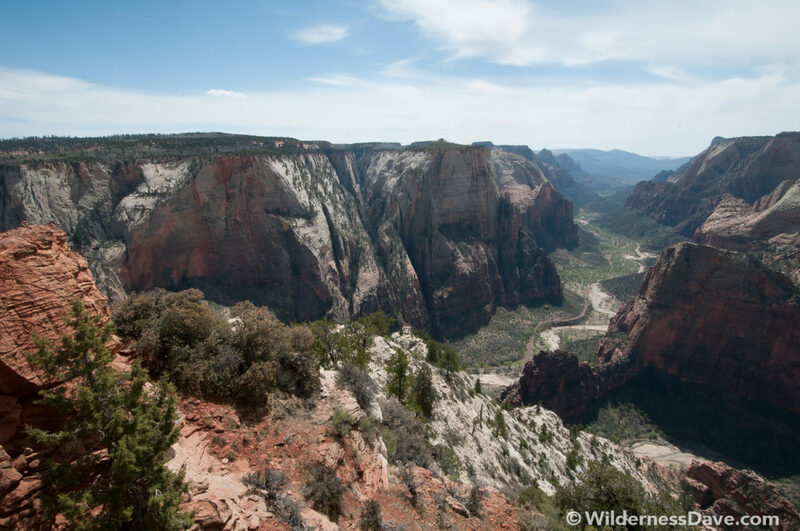 This one takes some time, and is one of the most popular hikes in the park for one reason…the view. From Observation Point you are treated to a plateau level view of the entire valley. The point itself sticks out from the adjacent canyon wall enough that you are awarded near 360 degree views down into the park. We sat at the point for a long time, resting the feet, taking pictures and befriending the local wildlife. We both dreaded the long downhill and what that would mean on our tired, old knees. I had expressed an interest in checking out Hidden Canyon, which we would pass on the way back down. We looked forward to a little uphill hiking again after the descent from Observation Point and didn’t lose a step in the transition. The trail to Hidden Canyon offered the kind of fun we found at Angel’s Landing, narrow trail clinging to the canyon wall, chains provided for the sketchy bits. We managed to pass a couple of other groups who seemed to be in over their heads on this one. I really love seeing those people on the trail, sweating with fear and clinging to the chains or rails with a death grip. They move slow and sure, sometimes swearing and screaming at a misstep or stumble. This, to them, is the pinnacle of adventure and they are doing it! It reminds me of my mother on the trail down to the pool below Mooney Falls in Havasupai. She was scared to death, but she made it. I’m there because I don’t fear those trails, I love it and I’m comfortable there. These people are there in spite of their fear and discomfort, pushing past their limits and experiencing wonder. It’s commendable. We found ourselves at the bottom of the trail on another shuttle, sore, tired and out of food and water. But we still had a little more of the most important commodity in our whole adventure…TIME. So we headed to The Narrows. After a refill of sweet spring water and a little “Vitamin I” we were back on the trail with a vengeance. Late in the afternoon, the River Walk Trail leading into the narrows is choked with “tourists”. These are typically NOT hikers or adventurers but “tourists” in the purest sense of the word and I’m not ashamed to admit that we bullied our way past the sluggish cattle. Our time was fleeting and we were moving with purpose. Reaching the end of the paved River Walk Trail we scuttled down the concrete steps to the rocky beach. We continued our brisk pace weaving past the people lingering there. We reached the water’s edge then, without hesitation, we continued our hike through the cold water. Further up the canyon the only people we saw were those returning from day hikes into The Narrows wearing wetsuits and drysuits and accompanied by a guide. We continued to pick our way up canyon, watching our footing in the swift water. I set up a couple of shots, feet going numb in the cold Spring runoff. We hiked as far into the canyon as we could, stopping before the water became deep enough to force us to swim. We returned to camp at dusk thoroughly used, tired, wet, hungry and sunburned. Surely a sign we’d done our duty well. We changed into dry shoes and clothes and walked to the Zion Brew Pub (Dave had convinced me that our day warranted more than freeze-dried backpacking food). We ended our epic day in Zion National Park the way one should end any epic day…with stories and beer. 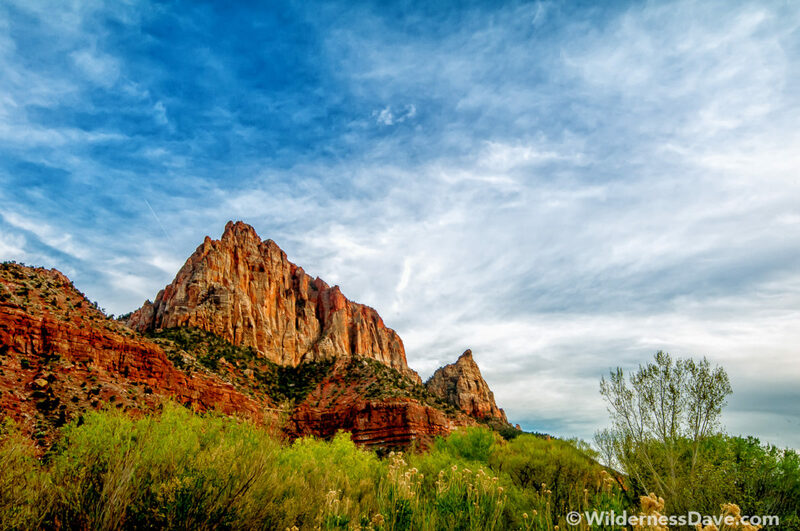 Many of these images from Zion National Park are available in print or download from my Gallery. 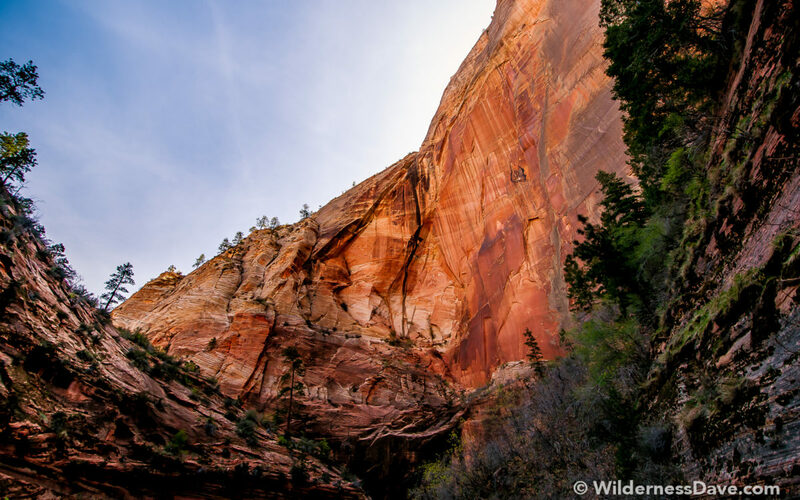 The late afternoon light was stretched low over the horizon casting long shadows in Zion National Park. I had unpacked my gear from the dusty truck in Watchman Campground and quickly set up my home for the weekend next to another small tent quietly occupying the same campsite under a large cottonwood. I didn’t know much about my mysterious campmate yet. Less than an hour earlier, I had received a single text message – all set in F4. They have a parking permit for you as you enter watchman campground. If I’m not in camp, I’m off exploring. Sounds like we’d get along just fine. 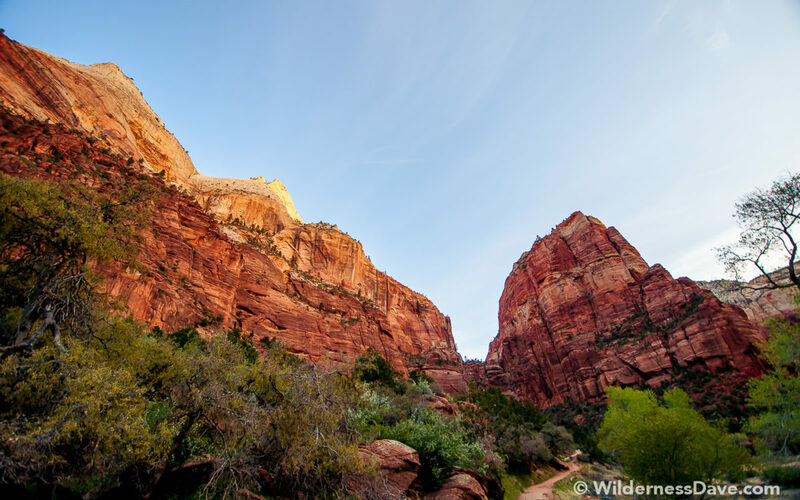 The National Parks and Monuments of Utah have always called to me, especially Zion National Park. I don’t normally make a huge effort to visit the National Parks, preferring instead to explore Wilderness Areas where I can find quiet and solitude. There are exceptions. When my dad passed away in 2005 we were in the planning stages of several trips together. We were on the wait-list for a private trip down the Colorado River, we were just starting to plan a trip through Yosemite along portions of the John Muir Trail and we were talking about touring the Utah Parks of Zion, Bryce, Arches and Canyonlands. 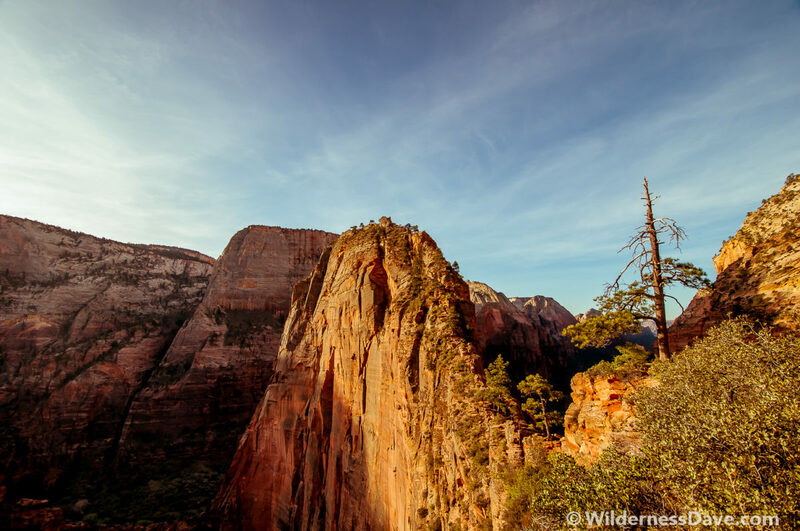 @DavidECreech @Active_Explorer FYI…you’re both coming to Zion with me 1st weekend in April to hike Angels Landing & Observation Point. The timing seemed to fit perfectly into my jigsaw puzzle of a travel calendar. I managed to scrounge up some petty cash for fuel, take the weekend off and drive 7 hours across Arizona and Utah to meet up with a fellow adventure seeker after nothing more than a handful of Twitter messages. Twitter has been funny that way, especially when it comes to the outdoor community. I see it happen all the time with messages like, “Anyone up for climbing near SLC this weekend?” or “I want to do Humphrey’s next time in Flag. Who’s in?” Social Media allows us to connect with like-minded people for outdoor adventures that just wouldn’t be as fun (or safe) alone. 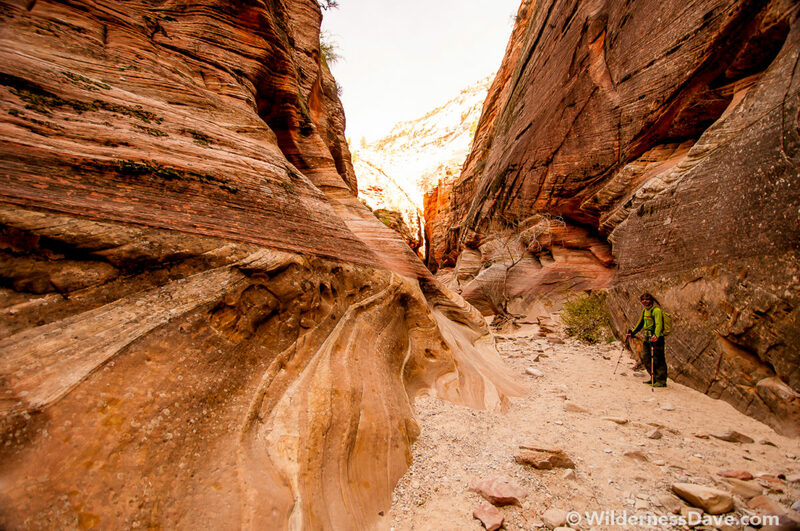 This time it was Minnesota native David Wherry, hell bent on making the most out of his first whirlwind trip to Zion National Park in the shortest time possible. David would have one day, sun-up to sun-down, to doggedly chase down as much adventure and general badassery (yes, it’s a word) as law would allow…and he was looking for a partner to help him run it down. 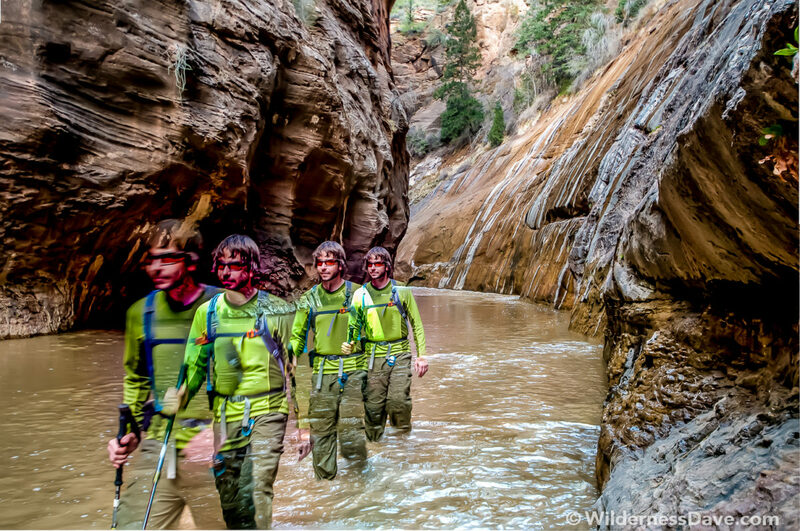 As I organized my gear at Workman Campground I knew we were staring down the barrel of a long sunrise-to-sunset day of steep, sweat-stained canyon hiking. So when Dave came strolling into camp after a casual 7 mile trail run, I knew he’d be the guy pushing the pace the next day.